The City of Hartsville utility bill is due by the 15th of each month. Late fees of 10% are assessed on the balance due if not paid in full by the 15th. Any balance not paid by the 20th is subject to disconnection without notice. A reconnection fee of $25 is added to balance. Account balance must be paid in full before service is restored. By drive-thru located at SPC Credit Union, 204 N. Fifth St. (8:00 am – 5:30 pm Monday – Friday). Customers must have their bill or account number and pay the full amount due with cash or personal check only, and only through the 20th of the month. Contact 843.383.3015 for more information. By drop box, located in the alcove at Hartsville City Hall, 100 E Carolina Ave, on the Carolina Ave side of the building. No cash payments. By mail, sending a check and the payment stub to the City of Hartsville, PO Drawer 2467, Hartsville, SC 29551. 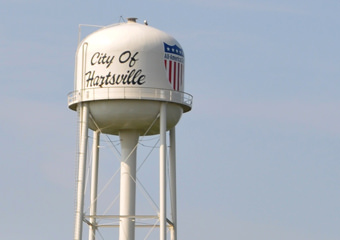 Generally, the City of Hartsville offers same-day service for connection of water. To request a utility disconnection, please submit the Utility Disconnection Request form. You can cancel automatic bank draft payments of your utility bill using the Utilities Bank Draft Payment Cancellation form.